Earlier this month, Berlin’s Tempelhofer Münzenhaus auctioned a collection of coins connected to 18th-century ruler Frederick the Great. Coverage by Coin World revealed that one of these coins was especially noteworthy as it was evidence of the economic warfare employed by Frederick against his adversaries in the Seven Years’ War. The Seven Years’ War (1756–1763) involved all of the major European powers. Pitting Russia, France, Sweden and the royal House of Austria against England, Portugal and Prussia, it is regarded as the first global war. There were two principal conflicts at work. The first dealt with Britain’s struggle against Spain and France for control of the New World and India. The second, which is most relevant to this article, began when Prussia’s Frederick the Great conquered Silesia, a territory hitherto controlled by Austria’s Maria Theresa. The infuriated Austrian monarchy joined forces with Sweden, Russia, Saxony, and France with the hope that the increased military power would curb the spread of the Prussian army. Frederick, then, formed an alliance with Britain. In 1756, Frederick successfully invaded Saxony. The plan was to prevent the armies of Austria and Russia from establishing a base in the area, gaining strategic geographic advantage. He would not, though, keep Russia’s military forces at bay for long. Russia’s Elizabeth I sought to push the boundaries of her empire westward and secured the province of East Prussia soon after. 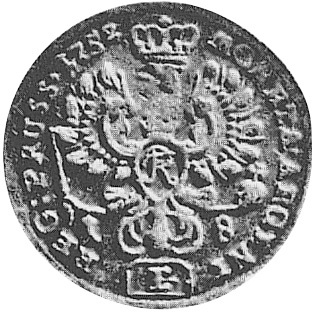 Elizabeth I ordered the Königsberg Mint to produce coins for distribution in her newly acquired territory. The reverse of this new 18-gröscher coin was virtually indistinguishable from previous issues. The obverse was altered to feature an image of the Elizabeth I, with greater denominations exhibiting Latin inscriptions. Elizabeth I demanded the fine silver content of the coins be the same as previous incarnations. Pieces found to possess with inferior silver content were quickly pulled from circulation. Frederick the Great saw an opportunity here to damage Russia’s economic infrastructure and boost his own. Hiring counterfeiters, Frederick struck imitation coins. The pieces, referred to as Ephraimiten, were struck of inferior silver content but maintained the same face value. This meant that when Russian merchants or consumers unwittingly accepted the counterfeit coins, the Prussian state was essentially profiting through theft. The imitation coins flaunted the inscription “RUSSIAE,” or “RUSSIA,” whereas the pieces commissioned by Elizabeth I featured the inscription “RUSS.” Initially, the general public had little respect for this difference, and circulated the coins as per usual. 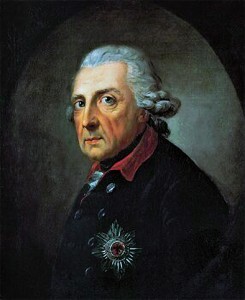 As a result, Prussia made considerable profit and used its newfound financial gain to support Frederick’s military exploits. The 1759 imitation 18-gröscher received a designation of Extremely Fine. Its estimated value was €1,200 ($1,288 U.S.) nearly fifteen times greater than the modern appraisal of an authentic coin from that era.